Motorcycle Accident Attorney in St Louis, MO. Burger Law is a team of personal injury lawyers that specialize in all areas of personal injury including motorcycle accident cases. Every year in America 4,000 people die, and 80,000 are injured in motorcycle accidents. Motorcyclists are at a significantly higher risk of injury or death when another driver does not pay attention and causes an accident because they’re offered little protection and forces on a rider’s body are great. Although a much smaller portion of motorists on the road are motorcyclists, motorcycle riders are 30 times more likely to die in a crash and five times more likely to be injured when compared to automobile drivers. Often automobile drivers don’t pay enough attention to motorcycles and do not appreciate their obligations to motorcyclists. Failure to keep a careful lookout, violating road signs and signals, failing to yield the right away, speeding, inattention, or drug and alcohol use are often encountered in motorcycle accident claims. If you or a loved one has been injured in a motorcycle accident, allow the Gary Burger and his associates to fight for the compensation you deserve. The Motorcycle Accident Lawyers at Burger Law have recovered millions of dollars to compensate victims of motorcycle accidents for injuries and damages caused by the negligent acts of another individual. When someone injures another person due to carelessness, they should be held responsible for the damages they’ve caused. Gary Burger and associates are committed to serving motorcycle accident victims with unbeatable support, and we will stand with you through each phase of your motorcycle accident case. Why Should Burger Law Handle Your Motorcycle Accident Claim? When someone is involved in a motorcycle crash, their case most likely has difficult legal, insurance and damage issues that require a seasoned motorcycle accident attorney to settle. Burger Law is dedicated to recovering for and protecting the future of motorcycle accident injury victims, and there is no fee if no recovery. For your free case evaluation, contact Burger Law by calling (314) 542-2222 or completing our online contact form. What Type of Injuries Can a Motorcyclist Sustain in an Accident? A serious motorcycle crash can leave you out of commission for a long period of time. Some injuries can even leave riders unable to walk or care for themselves. Injuries and conditions impacting the spinal cord or brain may leave a person fully or partially paralyzed, and in need of medical care for the rest of their lives. During this time, medical bills can start to rack up. If you want to obtain the compensation you need to pay your bills and maintain your lifestyle, a St. Louis motorcycle accident lawyer may be able to help. Let us advocate for you. Speak with a motorcycle wreck attorney with Burger Law today about your motorcycle accident claim. Can I sue for my Motorcycle Accident if it didn’t involve another vehicle? If a state or municipality fails to keep their roadways clear and safe for travelers, and your motorcycle accident happened because of an obstacle on the road or debris that caused your motorcycle to lose traction, you can pursue legal actions to recover damages. Every motorcycle accident claim is different, and some claims can be more complex and difficult than others. Our Motorcycle Accident Lawyers can take on your claim and guide you through the complexities of local and state laws to ensure that you get 100% of the care and recovery you deserve. We don’t charge any fees unless we win your claim. Drivers are legally and morally obligated to exercise a reasonable degree of care by adhering to traffic laws and keeping their eyes on the road at all times. Unfortunately, motorcycle crashes are relatively common throughout the country, especially in areas where drivers are not used to sharing the road with motorcyclists. If a driver fails to exercise their duty of care, whether due to intoxication, inexperience, or inattentiveness, they may crash into a law-abiding motorcyclist. Since drivers are required by law to remain aware of motorcyclists, they can be held liable in court for any injuries and property damage they cause by an experienced St. Louis motorcycle accident lawyer. Virtually everyone agrees on one thing: motorcycle accident injuries can be deadly. Accidents have the capacity to permanently disable riders and prevent them from ever living a normal life. To add insult to injury, motorcyclists are often faced with astronomical medical bills after being hit, and particularly serious injuries can lead to lifelong medical costs totaling hundreds of thousands of dollars. No one should have to pay for such costs when they are not responsible for the accident in the first place. By working with a St. Louis motorcycle wreck lawyer, motorcyclists can fight for their right to receive compensation for their physical pain and emotional suffering. 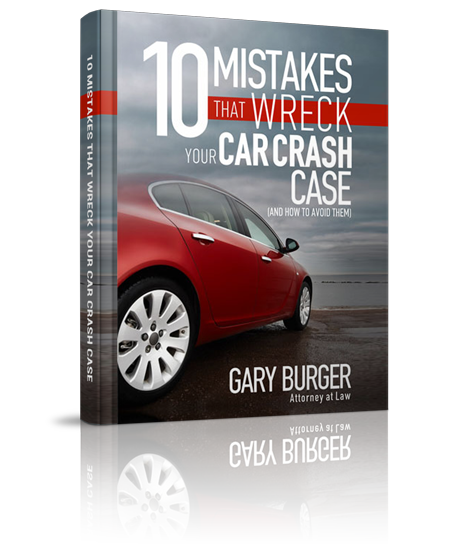 Gary Burger tried for Kim Wensler against Kim’s own insurance company who refused to settle the uninsured motorist claim. Kim was riding a motorcycle on a dirt road in rural Missouri when a truck came going the other way. Kim skidded, lost control and went under the truck and was injured. Her injuries were severe and her medical was high. She suffered some fractured ribs, lacerated spleen injuries to other internal organs. She had to undergo surgery and was left with approximately $60,000 in medical bills. The defendant strongly contended that she should not have been driving the motorcycle and caused the accident by her own negligence. However, the jury did not believe this defense and agreed with our position (and the real facts) that the defendant had crossed the center line and had caused the accident. The jury returned a verdict for $500,000 apportioning 5% fault on the Plaintiff and 95% on the Defendant resulting in a verdict of $475,000. Burger Law in this case was able to help an Imperial man injured in a motorcycle accident collect a big verdict. Gary knew from experience that his client would be a great person to testify on the stand, and his courtroom expertise helped net a big victory. The client was cut off by another driver while operating his motorcycle, which caused him to wreck and he was thrown from his bike. Randy sustained very serious injuries, one of which required surgery. Gary fought hard for Randy in the courtroom by showing negligence and carelessness on the part of the other driver, and obtained a $142,000 verdict.